I’m going to say right off the bat (no pun intend- whatever man, you get the joke) that I didn’t actually like the original Lego Movie (2014) that much when it first premiered. Its use of pop-culture references and self awareness instead of genuinely funny and organic humour and narrative drive made me write it off as a pale imitation of the Toy Story franchise. Lego Batman falls into a lot of these same pitfalls, but it feels slightly better implemented at least. And unlike The Lego Movie, which cynically shoots to a slightly older crowd with its oh-so witty self-reflexiveness and nostalgia pandering, part of Lego Batman’s strengths is that this film actually feels geared towards a child audience, with enough name drops and references to the Batman lore and mythology to satisfy any parents or diehard Batman fans who may find themselves in the audience as well. The number one positive with this picture, and indeed the crowning glory of its predecessor that can’t be denied by anyone, are the visuals. It’s incredible how well done these films are in terms of pure scenery, blending together flawless computer animation with photorealistic animation of the lego elements in the film. It’s the perfect crossroads of looking hand animated and CGI, with the way the characters move highly reminiscent of stop motion effects, but rendered on thousands of dollars worth of computing power to bring you a film that basically looks like what would happen if your lego set came alive while you were away. Even the character models retain the real-life defects and marks that the pieces suffer from, plastic mould seams and all. It’s absolutely beautiful and this film disappoints in no way in that regard, possibly even trumping the previous film’s formal elements. Another unexpected joy in the film is the sincerity in its message. The importance of not just family, but of relationships in general and how a lack of them can crush you to the point of emptiness. 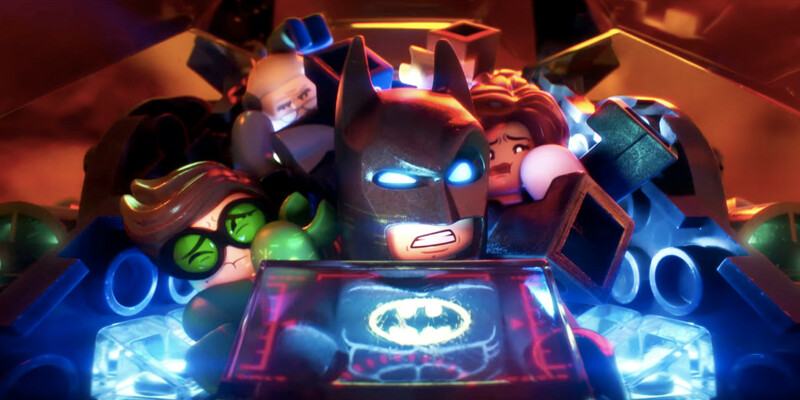 Lego Batman portrays a child-friendly meditation on identity, and how it’s shaped by the company you keep, be it in your family, friends or even in you worst enemy. Of course, all of this is well treaded territory in the Batman series, the duality of alter-ego Batman vs real-life Bruce Wayne commonly being the main focus of these stories, but this film does something different, in that it tackles the holistic world and idea of “Batman” and comments on it accordingly. Never before has there been such a wide spread mainstream analysis of the entire Batman canon, especially on film. In an age where superheroes are the main characters of most AAA blockbusters out today, and especially in light of Warner Bros.’ much more dour and serious take on the character in their new films, this film comes as a welcome introduction to genre deconstruction, especially since its specifically explained via the simple medium of a children’s movie. However, as great as those aspects are, there’re a lot of lows to the film. The story itself feels quite boring and by the numbers, with only a few unique takes on Batman’s aforementioned “relationships”. Also while this is totally subjective, the humour in the film is extremely geared towards children and seems to lazily repeat itself throughout. It seems that the most popular and easy go-to humour for screenwriters these days is having characters merely point out the absurdity of another characters’ actions/the situation they’re in/the narrative of the film/a mix of the previous three, and if you like that then great, this film’s full of it, but sadly this is practically all the jokes in the film. Still, there’s some occasionally pretty good gags, the best being in Robin’s introduction which I’ll leave you to find out. Overall, with good performances and a decent heart and soul, Lego Batman is by no means the worst kids movie out there, but it’s also not the best. If you’re a parent taking your kids or if you absolutely live and breathe Batman then I suspect it’s definitely worth a visit to the cinema. Tagged film review, kit ramsay, lego batman. Bookmark the permalink.